From lecture at Johns Hopkins University, Baltimore (1884). 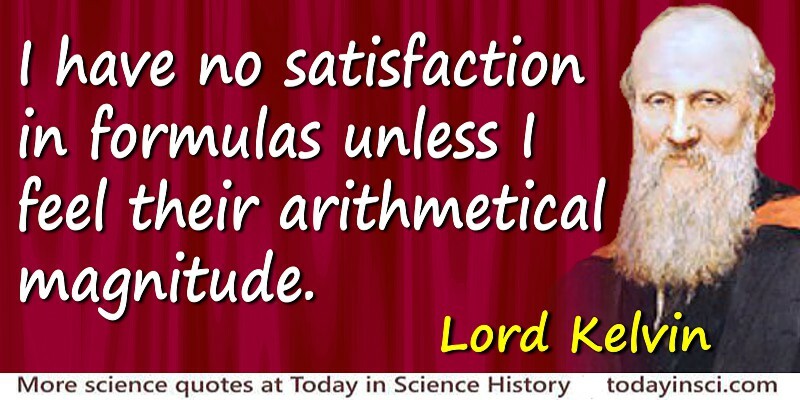 This quote comes from the seventh of the series of lectures Kelvin gave in the United States in 1884, at Johns Hopkins University, Baltimore, on topics concerning molecular dynamics and the wave theory of light. Specifically, in this lecture, Kelvin went through mathematical description, first on Lagrange’s analysis of the oscillation of a linear system for bodies connected in series and then he considered the propagation of disturbances in an elastic solid. He must have densely filled the chalkboard with equations which fill a number of pages in the printed record of his lectures.